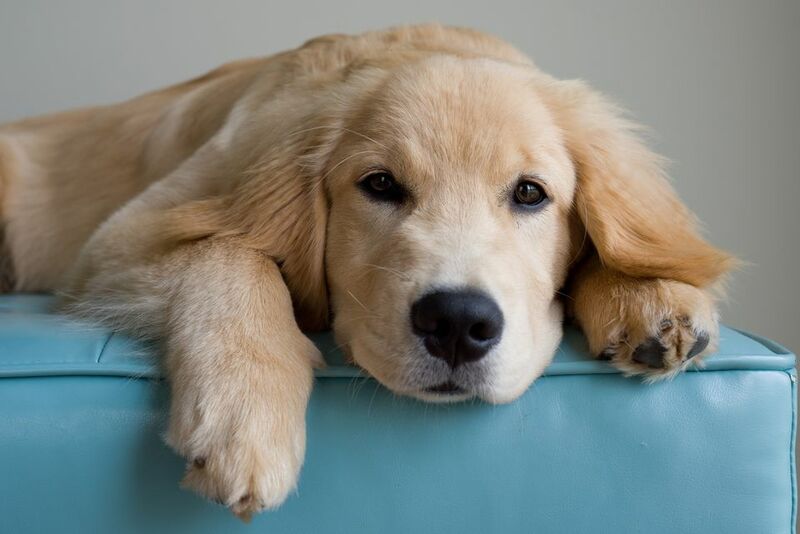 Any puppy can develop hot spots, though it's especially common in those with thick fur, like Golden Retrievers and Chows. Hot spots result from a deep-seated itch from fleas, ticks or other irritations that drive the pet crazy until it chews, scratches and bite the skin until it's raw. The technical term for hot spots is moist pyotraumatic dermatitis. A hot spot is an itchy bacterial infection of the skin caused by trauma. A bug bite, tiny sore or abrasion, or hair mats that cause itching prompt your pet to gnaw the spot until bacteria starts to grow. Hotspot sores can be extremely painful. They grow very quickly, from pinprick size to several inches in diameter within only 30 minutes. Untreated hot spots can grow 20 times larger in a single day. Although they look nasty, hot spots only affect the top layer of skin and heal quickly once treated. However, very large sores or those that don’t resolve need veterinary attention. If you catch them while small, first aid may be sufficient. Because the sore oozes, the fur often mats over and around hot spots, hiding the wound. That makes it difficult to know the extent of the problem, and also interferes with treatment. Trim the fur away, as close to the skin as possible. Electric clippers or a mustache trimmer works well, and won’t risk nipping the pet’s skin. Once you can see the sore, clean it thoroughly with an antiseptic such as a betadine product. A traditional remedy called Burow’s solution dries the hot spot and helps speed healing. You can find Burow’s at some pharmacies or grocery stores. Avoid using ointment on hot spots because that seals in the infection and may prompt it to spread deeper into the skin. Puppies usually just lick ointment off anyway. Instead, use a 5 percent benzoyl peroxide product, boric acid from the pharmacy, or even a used tea bag—black tea, not herbal. These have antibacterial properties and also help dry the sore. Steep the tea bag in hot water, cool thoroughly and then place against the sore. Apply a couple of times a day. Puppies often want to self-medicate by licking the sore place. You can find a restraining collar like an Elizabethan collar from the veterinarian or pet products stores. This fits like a cone around the pet’s face to prevent her from reaching to chew or lick the sore. Be aware that other dogs in the family often want to help her lick because the clear liquid that oozes from the sore seems to smell or taste good. Apply a tiny bit of Vicks VapoRub to the fur around the hot spot (not directly on the sore), and the menthol odor should be off-putting to these canine nurses. When the hot spot hurts or itches, very little stops a dogged puppy from licking. Products that contain witch hazel cool and soothe the discomfort but must be sprayed on the spot quite frequently. You can also ask your vet to recommend a first-aid pain relief spray that contains a topical anesthetic to temporarily stop the discomfort. Pain relief proves especially helpful until the sore begins to dry. After the first couple of days, the sore should become less tender. Some puppies refuse to let you touch him to treat the spot, so you’ll need veterinary attention from the beginning. First aid doesn’t help some dogs, and they’ll need antibiotics to kick the problem. Help prevent hot spots by keeping fur brushed to avoid mats, and preventing fleas and ticks. Your puppy will thank you.